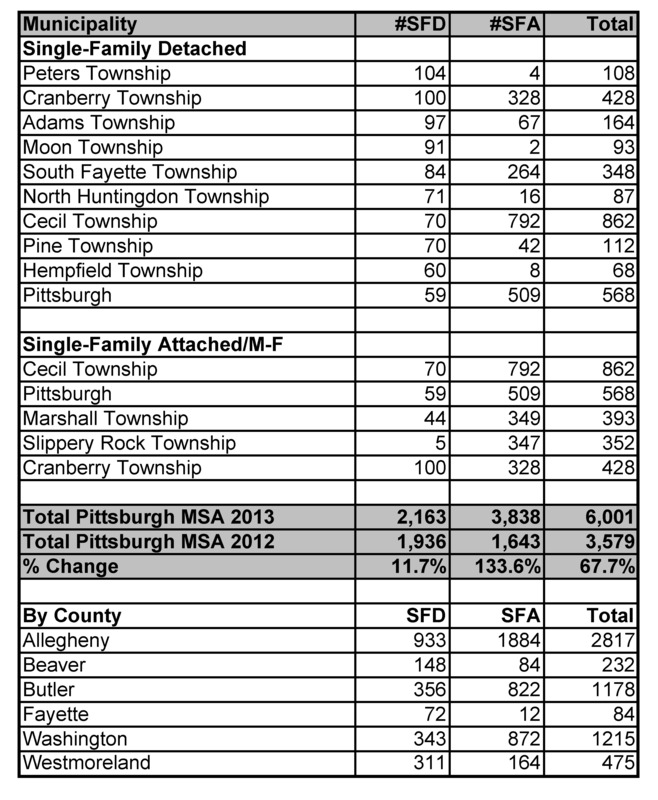 Driven by a 239% jump in new apartments, the Pittsburgh housing market reached 6,002 units started in 2013. That’s a new high since at least before the steel industry bust in the 1980’s. Demographics, rising rents and investment appetite combined to make a perfect storm for apartment construction. There were 3,838 multi-family units put under construction in 2013 compared to 970 units in the previous year. Another 2,000 or so units remain in the pipeline for the market but those projects not started in the first half of the year may get a yellow light. There are still very favorable demographics and low vacancy levels to support rising rents in 2014 but the problem is what will happen to the market in 2015 and 2016, when most of any new units will come on the market. Should home ownership rebound more than expected in 2014, the existing projects could feel a bit overbuilt. Permits for single-family homes “only” increased by 11.7% to 2,164 in 2013. The market has been struggling with a lot shortage on top of the unfavorable house market issues over the past few years but the improving conditions have spurred a big increase in residential development since late 2012. Those new subdivisions will just be available for builders this year. I expect that a combination of tight existing home inventory, along with rising rents and better economic conditions, will give a boost to home construction in 2014. Don’t look for the type of storm that blew the apartment market up but 2,500 new homes is not out of the question. The best sub-markets for new construction are shown below.